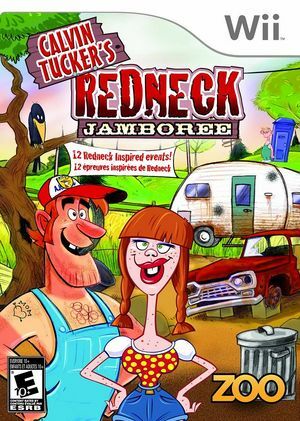 In Calvin Tucker's Redneck Jamboree every year, the people of Redneck County gather to compete in the great Redneck Jamboree! Now you have the chance to join them and test your redneck skills in 12 hilarious events. Join the four families of Redneck County as they compete to see who can win the most bottle caps in a battle to become the greatest family of the county for a year. Not only will you get bragging rights, but you'll also get the privilege to move in "The Big Trailer" where fabulous redneck luxuries await. Saddle up, partner, it's going to be a bumpy ride. The graph below charts the compatibility with Calvin Tucker's Redneck Jamboree since Dolphin's 2.0 release, listing revisions only where a compatibility change occurred. This page was last edited on 23 October 2017, at 19:03.